Every year, it is estimated over 30 billion original documents are created, according to the McKinsey Global Institute. 85% of the documents are not retrieved, 50% are duplicates, and 60% of stored documents are obsolete. 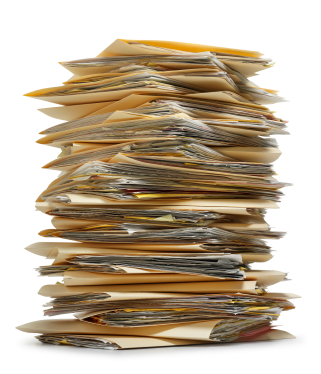 Yet document management is often overlooked and not considered of high-value. A well-run Document Management (DM) strategy can address numerous challenges including compliance requirements (e.g. GDPR) and furthering your organization’s digital journey. This post discusses more current challenges in today’s Document Management environment and how companies should address these issues. Document Management – What is it about? Document Management, an important component of Enterprise Content Management, can also be defined as the management of enterprise documents in digital or analog format. Today’s world enables access to more information than ever before and most of it is not being created by the companies themselves. With growing digitalization, organizations are challenged by enormous amounts of unstructured information residing in numerous platforms. Growing amounts of unstructured data, uncleansed systems and new technologies further stress the need for sophisticated DM within organizations. From our previous experience with DM projects with fortune 500 companies across industries, we have developed a list of common challenges/pain points that organizations typically run into with regards to the area of document management. How Can Your Organization Begin to Address These Issues? In short, CAMELOT’s Holistic Document Management Approach is to manage documents efficiently in the environment of processes, organization and IT. 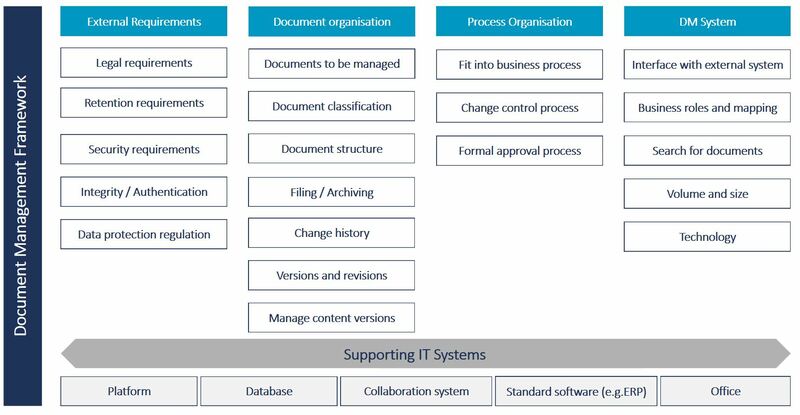 Our Document Management Framework (picture below) is broken down into four areas: External Requirements, Document Organization, Process Organization and Document Management System. The first pillar, External Requirements, focuses on regularity, integrity and authentication. Legal requirements either established by government agencies, financial authorities, or any other entity must be adhered to. Retention requirements stating what specific organizational, commercial and legal documents must be retained and for how long must also be taken into consideration to avoid any penalties. Document Organization, the second pillar, encompasses all administrative & organizational aspects including documents in scope, document classification and structure. General specifications of the document organization need to be holistically applied in the overall DM framework. The third pillar, Process Organization, harmonizes the organizational technical aspects of document management. Defining the processes that need to be supported and how they work, as well as aligning DM processes with BPM are some of the activities conducted. Finally, the last pillar is the DM system. DMS acts as an interface between external requirements, document organization and process organization by depicting their underlying structure and definitions. DM systems provide features such as document versioning, workflow automation, document search & tracking, audit trails and indexing. These systems have the ability to automate specific pieces of the DM process including document conversion, classification of documents, metadata capture, document distribution, etc. The time to take the next step is now. Improving your organization’s Document Management practices can be used as a lever for increasing competitive advantage and can act as a key differentiator. By establishing a holistic approach that encompasses people, process, organization and technology, CAMELOT can help your organization achieve sustained Document Management success. The author would like to thank Evan Pitt for his contribution & support of this blog post.